'Dhadak' vs 'Sairat': While movie buffs decided to roast the big Bollywood project with sarcastic one-liners, desi meme-makers flooded the micro-blogging site with hilarious memes. Dhadak, the Hindi remake of the National Award winning film Marathi film Sairat, is all set to woo movie buffs on July 20. In a star-studded event, Karan Johar launched the trailer on Monday (June 11). However, the trailer doesn’t seem to have struck the right note on social media. Starring Janhvi Kapoor and Ishaan Khatter, it got everyone talking on Twitter — but only to poke fun at the two star kids’ big break on the silver screen. Amid all the chatter, Netizens couldn’t stop highlighting Johar’s “dedication” to launch star kids and how “nepotism” was here to stay. Most people were disappointed about how it would “ruin” the super hit regional film, whose rights Johar bought after it entered the coveted Rs 100 crore club. While Sairat underlined the harsh reality about the wide caste divide in rural Maharashtra and revolved around two two youngsters in love, who fell prey to such prejudices, Twitterati feel Dhadak seems to be more about the economic barrier. Many also went on to say that Dhadak’s love story lacks the “rawness”, “innocence” and “magic” of the Nagraj Manjule directorial. 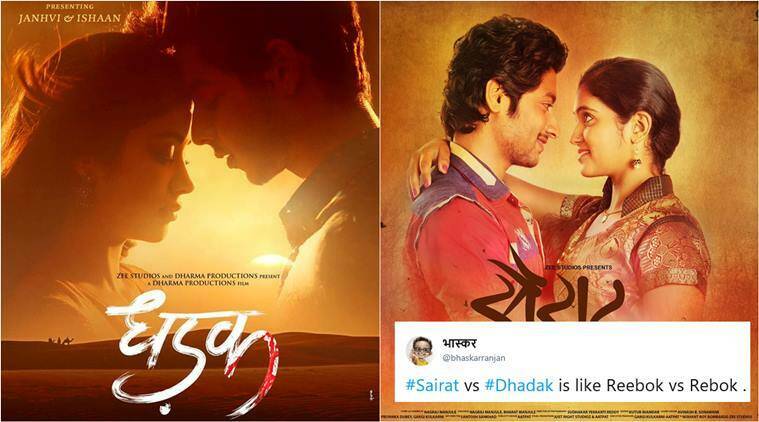 While some decided to roast the big Bollywood project with sarcastic one-liners, desi meme-makers flooded the micro-blogging site with Sairat vs Dhadak comparisons — juxtaposing bad copies of original things. The Hindi version of the National Award winning film has been directed by Shashank Khaitan, who is known for his other Bollywood love stories – Humpty Sharma Ki Dulhania and Badrinath Ki Dulhania.